Villa Meneghetti goes by several names. It is also known as Meneghetti Wine Hotel & Restaurant, and locally as Stancija Meneghetti. By any name, this high-end property furnishes a complete luxury getaway on a secluded estate. Location of Meneghetti Wine Hotel, Restaurant & Winery? Meneghetti is set in the coastal small town of Bale on Croatia's western peninsula, Istria. • Here on Luxury Travel, all the reasons Istria is called "the New Tuscany"
• And goes one better: Tuscany does not have Istria's scenic Adriatic beaches! How Do You Get to Villa Meneghetti? Most visitors combine a stay at Villa Meneghetti with other destinations in Istria, such as Roman-era Pula and the scenic island village of Rovinj. Villa Meneghetti is a luxurious Relais & Chateaux property. Villa Meneghetti strives to make visitors feel like they are being pampered at home -- if your home is a dignified Istrian villa. The villa is laid out in classic estate fashion. Villa Meneghetti is even smaller than a boutique hotel, with just four guest accommodations. These rooms and suites are quiet, private, and charming, with a rustic-meets-modern look. Villa Meneghetti guests are invited to a lavish buffet breakfast daily. 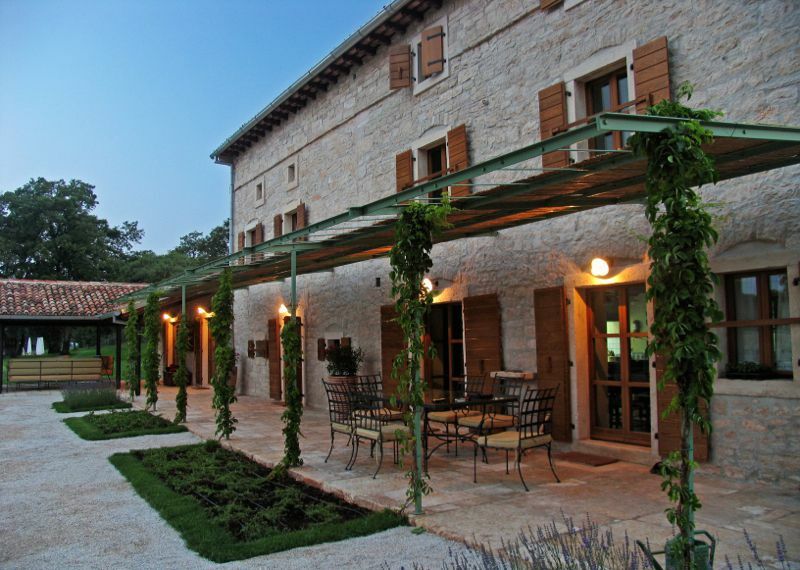 Istria is getting a name for its culinary heritage, and Villa Meneghetti Restaurant showcases the cuisine at its best. Every course at Villa Meneghetti Restaurant is proudly made with fresh Istrian ingredients, some grown right on the estate. You wouldn't be served these recipes anywhere but right here. Villa Meneghetti's property-made olive oil, made in several types and styles, consistently wins awards. Croatian wine earns high praise from oenophiles. Meneghetti Wines, one of the best-known labels, is a high-end winery that is emphasizes quality over quantity. Meneghetti Wines grows a range of grapes made into varietal wines and blends. Meneghetti Wines' wood-and-stone tasting room opened in 2015. Now, guests and visitors can sample and buy the estate's output. The tasting room offers a range of experiences. These wines are not currently available in the U.S., and you can't count on finding them at the airport. Most Villa Meneghetti guests come to relax in a refined inn with great food and wine. But there's a lot more to do here. The hotel offers two swimming pools: an outdoor pool surrounded by chaise lounges, and an indoor pool in a glass-and-stone room. The surrounding Istrian countryside and coast offer outdoor activities amidst unspoiled nature. Guests who want to immerse themselves in Istria's fascinating history can wander through picturesque medieval towns nearby.